Ok so it took a little longer than a couple of days to get this up. The end of season sale has been a lot busier than we expected. Even with everything being 50-70% off, the first week was the fourth highest sales week of the year. I’ve also spent a fair bit of time working on next year’s orders. There’s some very cool (and rare) plants booked already, especially in the conifers. I’ve also finally signed off on the paperwork to get someone to put together the website, www.johnsgarden.ca. It’ll take a little while to see some changes, but this should start happening in the next couple of weeks. This shrub is just a wonderful addition to any garden. 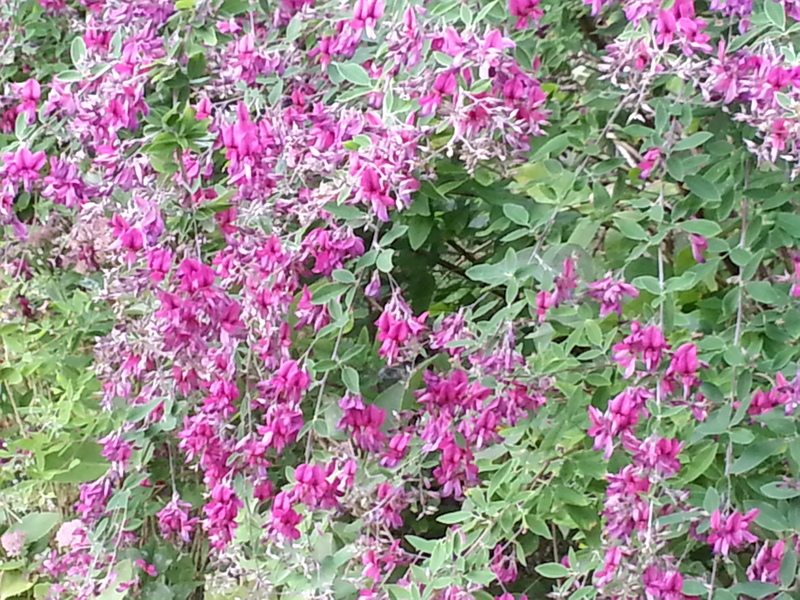 It’s called Lespedeza thunbergii ‘Gibraltar’ or bush clover. In my Canada Zone 5 garden, it dies to the ground each winter and I cut it to the ground in the spring, much like butterfly bush. Each year it gets to be five feet tall, and stands up straight all summer. 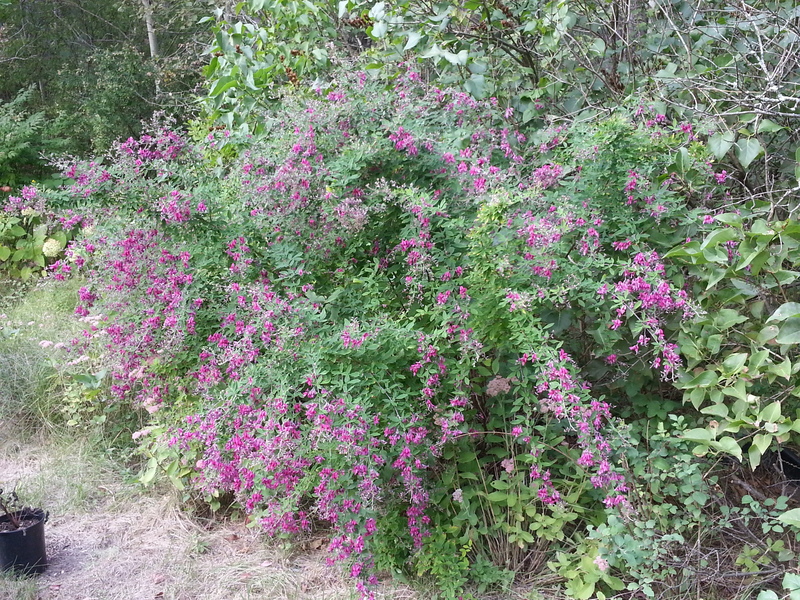 Then in September, when a lot of plants have finished blooming for the year, it gets covered in pink buds. As the buds open, the sheer weight of all of the flowers causes the branches to arch over and you get this gorgeous fountain of pink that lasts well into October. Even with our first frost coming weeks early on September 15, it kept blooming and looking amazing until a very hard frost/freeze did it in a week ago. It is very drought tolerant, which was a godsend this year. Mine is planted in sand, with good soil added when it was planted eight years ago. It wasn’t watered once this year, as evidenced by the very yellow grass that you can see in the first picture. All plants in my gardens have to fend for themselves. There’s just no time for coddling (or watering, or fertilizing, or weeding, or any of that stuff that most gardeners do to keep everything looking its best). There’s also the added benefit that since it’s a legume, it’s a great nitrogen fixer. 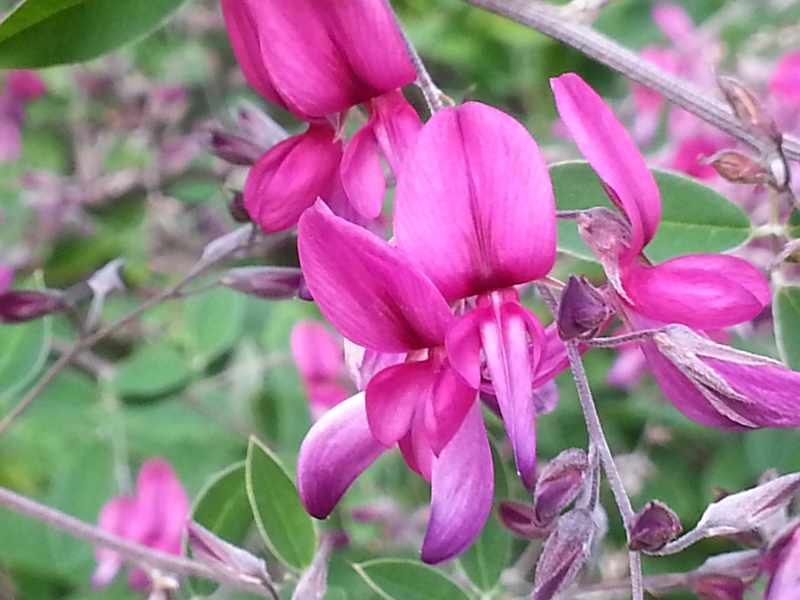 This entry was posted in Plant Focus and tagged bush clover, drought tolerant, Gibraltar, late bloomer, Lespedeza, September. Bookmark the permalink.